Any time you travel, it’s impossible to pass up the wonderful national museums that exist all over the world. 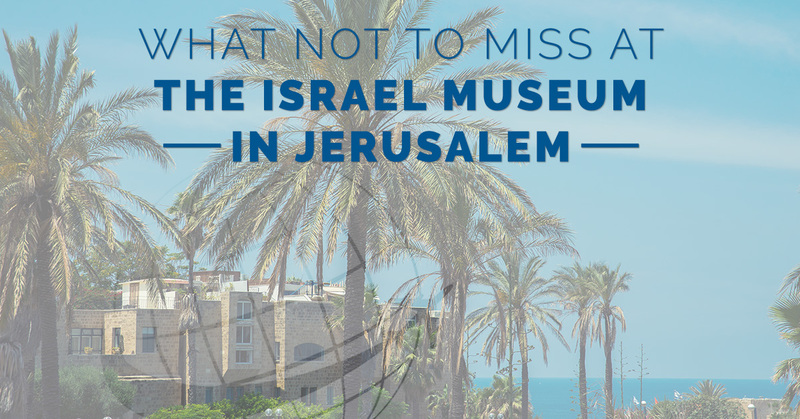 While there is a ton to see when you visit Jerusalem, so much so that it may seem silly to take an afternoon to wander a museum, the Israel Museum really shouldn’t be missed. In fact, it makes a great first stop during your time in Jerusalem in order to help you quickly learn about the ancient history and culture of the area. Along with a strong, arching collection of Israeli archeology and art, you’ll also get to see some pretty amazing things that have shaped our world today. Because museums can be so big and easily take up a ton of time, we’ve put together a list of things that you won’t want to miss during your visit, so consider prioritizing accordingly. The Dead Sea Scrolls are a true gem both for archaeological purposes and as an enlightening part of Jewish history. These scrolls were found in the early 1950s on the northwest shore of the Dead Sea. What’s truly remarkable about these scrolls and scroll fragments is that they are dated to around the third century BCE and are some of the earliest known writings for Jewish biblical text in the world. With over 850 handwritten fragments of varying lengths, when you enter the Shrine of the Book at the Israel Museum, you’ll note that only some of the texts are on display. The rest are kept under lock and key in the museum vault in order to preserve these historical treasures. However, full digital copies are available online of the most notable scrolls that describe both Jewish Heritage and also other events of the time. The Aleppo Codex is something that no Jewish Heritage Tour should leave out, and history buffs are simply going to love it. Also found in the Shrine of the Book, the Aleppo Codex is a Hebrew Bible that dates from roughly the 10th century CE. This written manuscript became the definitive point of translation from Hebrew of the Hebrew Bible in other languages. In addition, the codex includes both pronunciation and many other features that help to shape and define Jewish texts. Along with being the oldest Hebrew Bible in existence, the Aleppo Codex has a varied and sordid history that ends when it was finally smuggled out of Syria in the 1950s and to Jerusalem, where it now resides. Covering almost a full acre, this outdoor model depicts Jerusalem as it was during roughly 66 CE, prior to the Great Revolt against the Romans in 70 CE, which destroyed much of the city. The model was originally built as a tribute from a father to his son who died fighting for Israel. However, it was eventually moved to the Israel Museum grounds for all to enjoy the cultural heritage of the area. While the streets are a bit too small for you to walk in, you will be able to walk around the entire model and observe what daily life might have been like during the birth of Christianity. The model was built utilizing texts like the Dead Sea Scrolls in order to provide the most accurate detail of the city. If Jewish history interests you, as it probably does, the Israel Museum has an extensive permanent collection of both Jewish art and archaeological finds. Among the permanent collection, you will find a wide variety of galleries that cover all aspects of Jewish life, from the synagogue to daily life. One of the more interesting collections worth walking through is the Jewish Costume and Jewelry galleries. These galleries contain an extensive collection of clothing and accessories from the 19th and 20th centuries that come from around the world, and has helped to define Jewish culture. While you may take for granted the coins in your pocket, the origins of money date far back to when coins were used as a form of trade. Since the inception of coins being representative of value over 2500 years ago, currency has become just another way to look at history. The Coins in Context collection looks at the connections between current day money and the coins that have been used throughout the last several millenia. If You Have the Time…. While we’d probably argue that the following collections are also “must see” collections, we also understand that there isn’t always time for absolutely everything on your Jewish heritage tour. If you have the time and are a total history buff, or simply love to see antiquities, the following two collections are both extensive, but well worth the time as well. Because you are traveling in Israel to learn about the country’s past and present, hitting up the archaeological exhibits that specifically address Israel throughout the ages is probably a good idea. The Israel Museum covers everything from humanity’s humble beginnings all the way through the Middle Ages during the time of the Crusaders. You get the chance to deeply look at how the Romans influenced Israel’s history and how the Holy Land came about. Pick and choose which time periods interest you the most and spend more time in those galleries. If you love art, you’ll probably want to make time for at least one or two of the various art collections in permanent residence at the Israel Museum. However, if you’re not a huge fan, you can probably skip them. Keep in mind that you will see works across a wide variety of time periods and styles, including works by Rembrandt, Rubens, Monet, Renoir, van Gogh, and works by a wide array of Israeli artists in the permanent art collections. With the rich history and culture that can be found in a single place, the Israel Museum should not be missed. Make sure to take time to plan your time at the museum in advance so you get to see both the highlights and the works that interest you the most. And remember, when you travel to Israel, book with World Express Travel.